- Data breaches and cloud – does cloud make data breaches more likely, and why? In this lively session, you’ll learn about the most common security mistakes made by admins and we’ll demonstrate how you can stay safe. Many enterprises, including voter analytics firms and phone companies, have inadvertently exposed records by failing to properly secure data stored in the public cloud. While cloud computing has made it simple to spin up a new server without waiting for IT, this can also be a security nightmare. A simple misconfiguration or human error can compromise the security of your organization's entire cloud environment. Good security hygiene should always be an integral part of the DevOps workflow, however, this isn’t the reality at many organizations. Las empresas preocupadas por el uso de las aplicaciones cloud están empezando a utilizar soluciones CASB (Cloud Access Security Broker) y pasarelas de seguridad Web (SWG) para proteger a sus usuarios a la vez que les permiten tener flexibilidad e incrementar su productividad. Los desafíos y amenazas en el mundo actual de la nube y la movilidad, donde los empleados de las organizaciones están cada vez más distribuidos. Cómo las organizaciones están adoptando SaaS, IaaS, y control Web con una estrategia que hace posible entornos de trabajo seguros. Descubra como administrar y proteger qualquer serviço Cloud assim como Web. Com funcionários cada vez mais habituados a dispositivos móveis e à nuvem, sua empresa pode se beneficiar do aumento de flexibilidade e produtividade. Infelizmente, também há um lado negativo. O uso de SaaS, IaaS e serviços da web pode trazer novos riscos aos dados e representar mais vulnerabilidade a ameaças, como malware. As plataformas de segurança na nuvem estão começando a usar tecnologias de CASBs – Cloud Access Security Brokers e de gateway seguro da web (SWG, Secure Web Gateway) para ajudar a proteger suas empresas, garantindo flexibilidade e produtividade. - Como as empresas estão adotando SaaS, IaaS e web com abordagem de sistema para permitir o uso seguro da nuvem e da web. - Cloud Security Use Cases rund um die Nutzung beliebter Public Cloud Apps wie Microsoft Office 365, Salesforce, Slack oder Workplace. - Wie kann CASB dabei helfen, riskante Aktivitäten in der Cloud zu verstehen, sensible Daten zu schützen, Online-Bedrohungen zu stoppen und auf Vorfälle zu reagieren? Und dies in einer Art und Weise, die den Arbeitsgewohnheiten und -weisen von heute entspricht. Conseils venant d’experts concernant la sécurité Cloud et Proxy Web. L’engouement croissant de vos collaborateurs pour le cloud et les solutions mobiles peut permettre à votre entreprise de gagner en flexibilité et en productivité. Malheureusement, il peut y avoir un inconvénient à cette évolution. En effet, le recours aux services Web, Saas et IaaS peut faire courir de nouveaux risques, notamment aux données utilisées, et générer des menaces comme les malwares. Les plateformes de sécurité en mode cloud commencent à avoir recours à des technologies CASB (cloud access security broker) et de sécurisation du Web (SWG) pour protéger les entreprises sans entraver leur flexibilité et leur productivité. Cloud security platforms are starting to use cloud access security broker (CASB) and web security (SWG) technologies to help secure their organisations while still enabling flexibility and productivity. Netskope supports adaptive access control for Azure, extending real-time visibility and control to both users on personal devices accessing the sanctioned Azure instance and users on managed devices accessing both sanctioned and unsanctioned instances of Azure. The Dark Web is a well-known part of the internet where many sites are not indexed by search engines and can only be accessed if you know the site address, making them effectively hidden. Accessing the dark web requires special software, like browsers configured with Tor. Once inside the dark web, “dark net” markets exist that sell sensitive data stolen in breaches (in addition to illegal products like drugs and firearms). The currency of choice is the cryptocurrency Bitcoin. But there is one area arguably more dangerous and much larger in scale, and that is the Bright Web. We use the bright web every day, and it consists of tens of thousands of places where sensitive data can be easily uploaded and shared publicly either with malicious intent or on accident by unsuspecting perpetrators. Watch this webinar to uncover the current state of the bright web, how it affects you and your company, and how recent technology advances provide the visibility and control you need to safely maneuver the Bright Web. The coming into effect of New York's cybersecurity compliance requirements for financial institutions and their third party service providers marked a major development in the cyber risk regulatory environment. In this social webcast you’ll meet Netskope’s product experts as they discuss some practical steps to help you achieve cloud compliance with the regulations. Robert Bond, legal expert in data protection and information security, and Andy Aplin, Netskope's EMEA Engineering Manager, walk you through a short summary of the GDPR Countdown Audit Stage. Berkshire is growing. Learn how Netskope helps enable their growth with safe cloud enablement. Ryan Melle, Berkshire Bank VP Information Security Officer, shares three use cases where Netskope helps Berkshire Bank enable the cloud: Cloud DLP, Granular Access Control Policies, and Netskope for Salesforce and Office 365. - how to build a new security stack as resilient and nimble as the new workforce they protect. 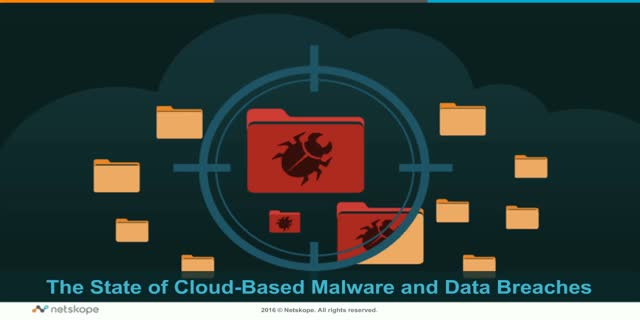 Get a technical analyses of recent malware campaigns discovered or documented by Netskope Threat Research Labs and learn how to defend against them. Cloud services have emerged as the preferred attack vector of some of the most dangerous and innovative cloud malware exploits of the past six months. Why? Because many organizations don't inspect their cloud SSL traffic for a malware and the same functionalities of the cloud dramatically increase productivity (sync, share, collaborate, etc) also provide ransomware developers with a perfect medium for faster delivery of malware payloads to more targets. Join Netskope chief scientist Krishna Narayanaswamy and Director of Netskope Threat Research Labs Ravi Balupari for a fascinating look at how malicious actors now design ransomware to make best use of popular cloud services to hide in plain sight, and do more damage in less time. Krishna and Ravi will provide technical analyses of recent malware campaigns discovered or documented by Netskope Threat Research Labs. Cloud app security is a top priority for many enterprises. Whether securing data in the Office 365 suite, ensuring compliance in ServiceNow, or getting control over shadow IT, information security leaders are exploring how Cloud Access Security Brokers (CASB) can make an impact in their organizations. Join Bob Gilbert, chief evangelist of Netskope, for a session on the top five CASB use cases that have the highest impact on cloud-consuming enterprises. •How those use cases translate to “must have” requirements for any CASB evaluation. The rapid rise in cloud adoption – of which corporate IT has underestimated the scope by as much as 10x - has created a new effect: a “cloud attack fan-out.” Between many connected devices, which increase the attack surface, and capabilities like sync and share, which increase data velocity in the cloud, both the propensity and the severity of a breach rise. Netskope™ is the leader in cloud and web security. Using patented technology, Netskope’s cloud-scale security platform provides context-aware governance of all enterprise online usage in real-time, whether accessed from the corporate network, remote, or from a mobile device. This means that security professionals can understand risky activities, protect sensitive data, stop online threats, and respond to incidents in a way that fits how people work today. With granular security policies, the most advanced cloud DLP, and unmatched breadth of workflows, Netskope is trusted by the largest companies in the world. Netskope — security evolved.